Touching writing, a brilliant cast, and inventive staging. Fun Home is a coming-of-age musical that entertains while tugging on the heartstrings. Alison (Sara-Jeanne Hosie) grows up in an unconventional household. Her father is a funeral home director and she, along with her two brothers, sometimes helps Dad with the family business. After she goes away to college, she has a revelation that she’s a lesbian and begins a romance with Joan (Sara Vickruck). Little does she know, her father (Eric Craig) is a closeted gay man who has been having affairs during her parents’ entire marriage. As Alison says, she “leapt out of the closet,” and four months later her father killed himself. Alison has a complicated relationship with her father. “Sometimes my father appeared to enjoy having children,” she says in the opening scene. She loves and respects him, but realizes that he was distant, neglectful even, and that when he shamed her, saying things like “you’ll be the only girl at the party not wearing a dress,” these actions stemmed from his own inner struggles with his identity. 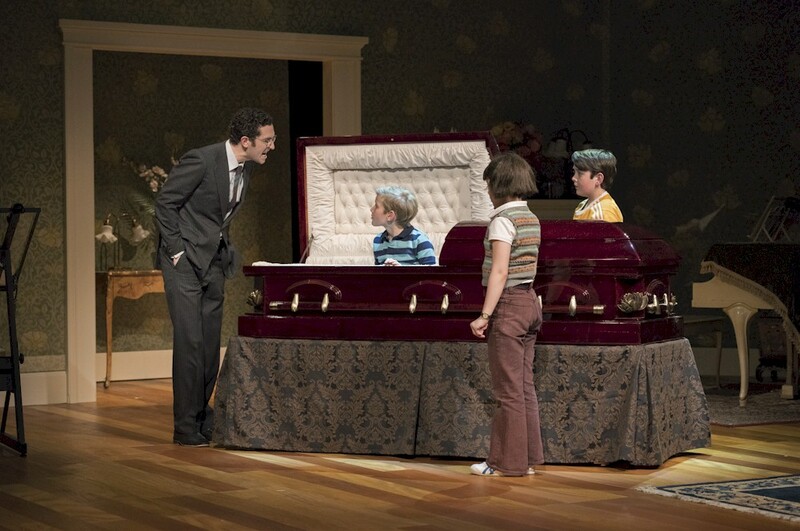 Despite the troubled marriage and her father’s distance, Alison and her brothers, Christian (Glen Gordon) and John (Nolen Dubuc), were happy kids — one of the highlights of the show was their “commercial” for the Fun Home (the family name for the funeral home). Their upbeat musical theatre number almost made you forget they were singing about dead bodies. “Telephone Wire” was another beautiful song that expressed the anguish of Alison’s last conversation with her father as they drove around the countryside and she urged herself to talk to him about his secret identity. There are so many tender moments that it’s hard to take them all in. The show is full of endlessly evocative songs, brilliant acting, and many funny moments such as Alison matter-of-factly writing in her childhood journal, “Dad showed me a dead body today,” her dad telling her “You learn at college that people aren’t as smart as you want them to be,” and Alison triumphantly singing “I’m changing my major to Joan” after their first night together. Fun Home is a masterpiece of a musical.